Every member of the Vectis Corps of Drums Marching Band received a certificate of achievement for their contribution and dedication to the band, with additional awards in several categories. The Vectis Corps of Drums Marching Band have recently celebrated their 26th annual presentation and awards evening. Every member received a certificate of achievement for their contribution and dedication to the band. Additional awards were presented as well. 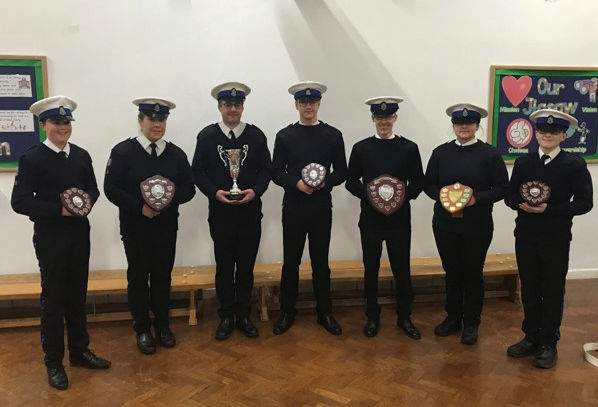 Billy Williams received the Best in Section for the corps of drums, whilst Oakley Whitewood was presented with Best in Section for the percussion section. Matthew Seal received Best in Section for tuned percussion and Jack Higgs received Best in Section for the wind section. Other awards included the Newport and Carisbrooke Branch Royal British Legion Award which was presented to Nicole Whitewood. Joseph Williams and Hannah Brown were presented with the Overall Member awards for their effort and commitment throughout the year. The Bandmaster’s Award was presented to Dan Smith for his outstanding contribution and leadership to the corps of drums and Mike Early was presented with the Vectis Corps of Drums Community Award for his contribution across all the sections of the band. Abbie Cunningham was presented with her 15 years of service to the Vectis Corps of Drums medal. The band is now in its 27th year and can be seen taking part in various events across the Island. They are always looking for new and experienced players to join them. For more information on joining or booking the band please contact the band through their Facebook page, email: vcodmb@hotmail.com or call the Bandmaster on 822431.